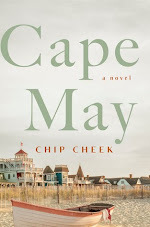 Goodreads says, "After losing her parents in a tragic accident, surfer girl Janie Mason is forced to trade the sunny beaches of Hawaii for the cold fog of San Francisco. She’s never even met her new guardians, the Rochesters—an old money family who relish being pillars of high society. Janie feels hopelessly out of place in their world of Napa weekends, fancy prep schools, and cotillions. Nicholas is the only Rochester who treats her with anything resembling kindness—but he’s only six. When she strikes up a friendship with Daniel, a fellow surfer, it feels like things might finally be improving. But something isn’t right in the Rochester mansion. There are noises—screams—coming from the attic nearly every night. Noises everyone else claims they can’t hear. Then John, the black sheep of the family, returns after getting kicked out of yet another boarding school. Soon Janie finds herself torn between this new “brother” and Daniel, who has secrets of his own. Just when she thinks her life can’t get any worse, she learns the truth about the Rochesters: what they’re hiding, what they want from Janie, and how far they’ll go to get it." Janie Mason, a Hawaiian surfer girl, was living the perfect life with her parents, but all that comes crashing down after her parents' untimely death. She comes to find out that her parents' will has stated that her legal guardians would be the Rochester family who live in San Francisco. Janie has never met this family and they didn't even show up to her parents funeral. So how close could her parents possibly be to them? What were her parents thinking? Upon her arrival to the Rochester's sprawling estate, Janie meets their housekeeper, who barely speaks to her and isn't even greeted by Mr. and Mrs. Rochester themselves. However, Janie does meet Nicholas, the youngest son, who does actually talk to her, but is super strange. He keeps referring to his twin sister, who Janie comes to find out is actually dead. Once Janie does meet Mr. and Mrs. Rochester, she isn't impressed by Marian Rochester, who is the ultimate mean girl/Real Housewife, and Richard Rochester seems to genuinely care as he was best friends with Janie's dad, but something is off about him. To complicate matters further, they have a daughter who is around Janie's age and she pretty much despises Janie and the fact that she has come to live with them. Combine all of this with the fact that Janie is hearing strange things at night in the part of the attic above her room and the realization that she hasn't surfed in so long makes for a depressing time. 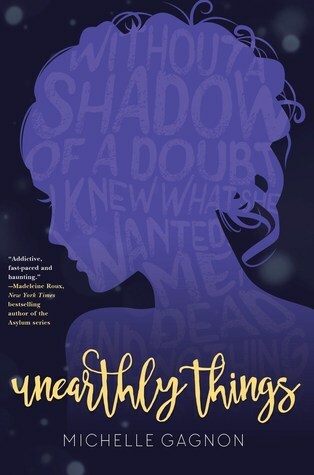 Michelle Gagnon's Unearthly Things is an edge-of-your-seat suspenseful retelling of Jane Eyre. It definitely had my heart pumping. 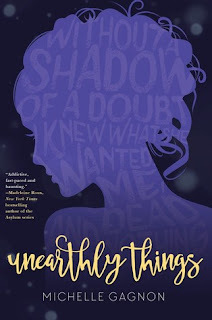 I really enjoyed the character of Janie in Unearthly Things. She's born and raised in Hawaii and loves the surfer lifestyle. Her parents are happy, their house is idyllic, and she is living a good life until her parents' accident. Janie's flashbacks to her parents happy marriage, their lazy weekend mornings, and different memories she shared with her father really tugged on my heartstrings. It made it that much worse that she has to start over in San Francisco and in such a cold environment. The Rochesters are the polar opposites of her parents. The Rochesters, inspired by the characters from Jane Eyre, are truly chilling. Marion is controlling and delusional, Richard seems nice, but we know he's hiding something, and the kids at Janie's new private school aren't very welcoming. Things are pretty depressing for Janie in San Francisco until her surfboard finally arrives from Hawaii and she finds a cold, but surf-able beach. There she meets a good looking guy from her school and they hit it off. So maybe things are looking up for Janie? No. Not really. There are strange noises coming from the attic and despite investigating what it could be, she can't quite figure it out. Nicholas, the youngest Rochester son, also creeps her out with talk of his dead twin and his strange behavior. Things are straight up creepy at the Rochesters. As more time goes by, Janie realizes there may be more to her will than she realized in Unearthly Things. What could the Rochesters be hiding? What happened to Nicholas's twin? And the arrival of the eldest Rochester son, John, who is expelled from his most recent school, also throws the family into a bigger mess than Richard Rochester can handle. As Janie starts to put together the pieces, the suspense increases in Unearthly Things and the Gothic elements of the novel really start to come together. This book truly had me on the edge of my seat. It seemed that Janie couldn't catch a break and was constantly being thrown into one crazy situation after another and although it seems unlikely that would happen, it does make for an entertaining read. My only issue was the romance in Unearthly Things. I wasn't feeling it as much as I hoped, but because I focused so much on the mystery part of the novel, I didn't mind. As far as retellings go, I really liked this version of Jane Eyre. It was surprisingly entertaining! I think you'll like it despite the fact that you haven't read Jane Eyre. It was a really suspenseful read. I hope you enjoy it and thanks for visiting! Ohhh I'm excited to read this! Jane Eyre retellings are rare so I tend to grab them when I can. I hear you. I think you'd like this one. It kept me on the edge of my seat. Thanks for visiting, Joy! I am really curious about this retelling of Jane Eyre. It sounds so different from other modern retellings of the book. I want to know how similar and how different the characters are. Thanks for your review! I'll have to borrow this from the library sometime. I think you'd like this retelling. It was surprisingly good! 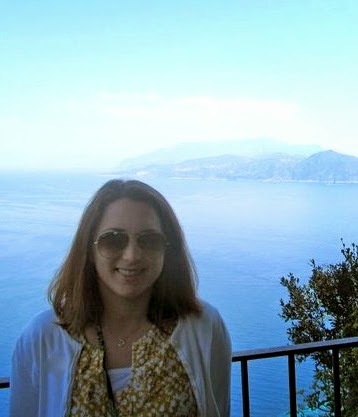 Thanks for visiting, Christina!